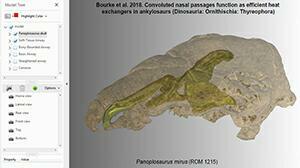 Nasal air conditioners helped armored dinosaurs keep a cool head. A decade ago, Ohio University researchers discovered that armored ankylosaurian dinosaurs had long, convoluted nasal passages. Now, new research from Ohio University, drawing on advanced imaging, engineering-based computer modeling, and anatomy, has shed light on these features, suggesting that these large-bodied dinosaurs had elaborate “krazy-straw” nasal passages that functioned as efficient air conditioners to cool blood that was shunted to the brain cavity to help maintain brain temperatures within safe limits, helping the animals avoid heat stress. 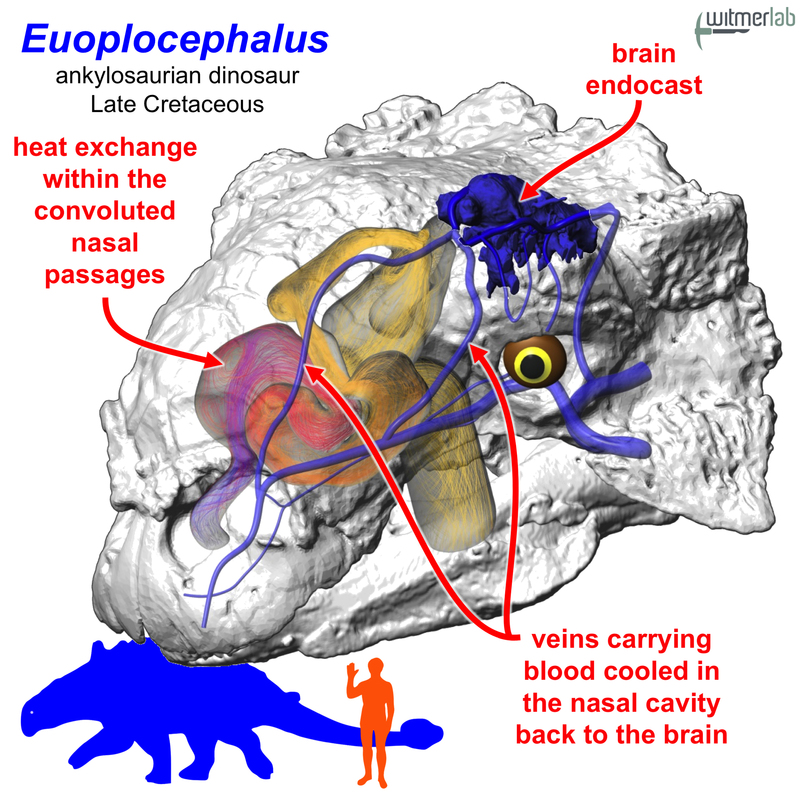 Large-bodied animals, such as the two 75-million-year-old ankylosaurs—Euoplocephalus and Panoplosaurus—that were the focus of the study, face thermal challenges in that they tend to retain heat and are at risk of heat stroke, because the hot blood from the body core can damage the delicate brain tissues. Simulations of nasal airflow revealed that the dinosaurs’ long tortuous nasal passages functioned as efficient heat exchangers, warming and humidifying the air on its way to the lungs. Analysis of CT scans revealed large canals for blood vessels running next to the nasal passages that led to the bony brain cavity. As the animals breathed, evaporation of moisture would have cooled the venous blood in these canals, providing a mechanism to cool the brain even as their bodies heated up in the Cretaceous sun. To test if the long, “krazy-straw” airway was the key to evolving this efficient air conditioner, the researchers modeled a short and simple airway (like ours) as well as a long but straight airway (no twisting). In both cases, the efficiency dropped dramatically, suggesting that indeed both the length and convolutions evolved to enhance physiological efficiency. 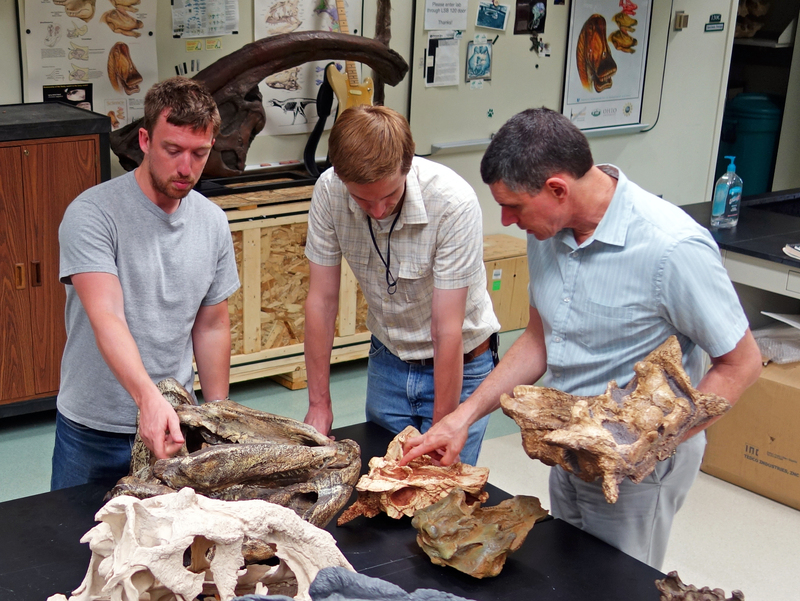 The researchers are now exploring whether other large-bodied dinosaurs had similar mechanisms. This research was funded by grants from the National Science Foundation. A technical article was published on 19 December 2018 in PLOS ONE. Bourke, J. M., W. R. Porter, and L. M. Witmer. 2018. 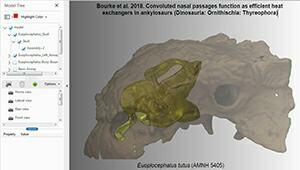 Convoluted nasal passages function as efficient heat exchangers in ankylosaurs (Dinosauria: Ornithischia: Thyreophora). 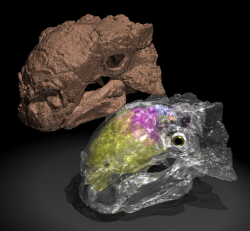 PLOS ONE 13(12): e0207381. 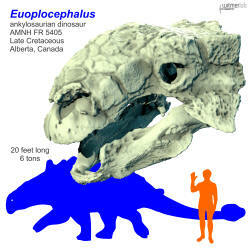 The skulls of the two ankylosaurian dinosaurs—Panoplosaurus and Euoplocephalus—that were the focus of the research. The skulls are rendered semitransparent, revealing the convoluted “krazy-straw” nasal passages coiled within their snouts. Colors within the nasal passages show the heat exchange modeled by the computational fluid dynamics analysis. The heat exchange allowed efficient warming and humidification of the inspired air. 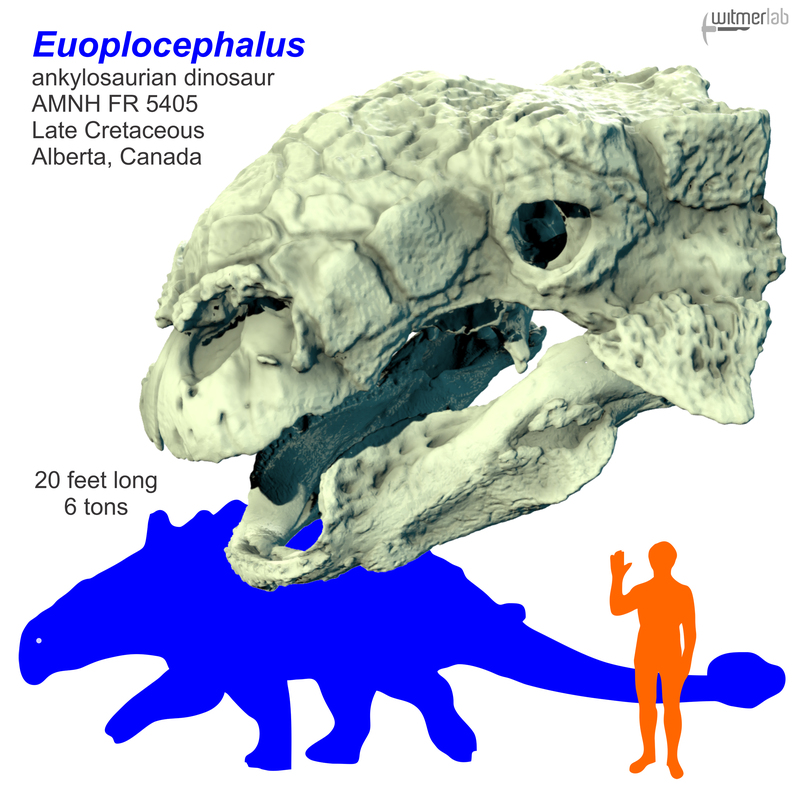 The more elaborately coiled nasal passages of Euoplocephalus were more efficient than the simpler ones of Panoplosaurus. Courtesy of WitmerLab at Ohio University. The Late Cretaceous armored dinosaur Euoplocephalus (center) had a long, highly convoluted nasal passage coiled up in its snout. The physiological efficiency of heat exchange was tested by computational fluid dynamics analyses that compared the (top left) “bony bounded” airway (i.e., as preserved in the fossil), (top right) the “soft tissue” airway (closer to real life due to restored nasal mucous membrane), (top middle) the “basic airway” (short and simple, as in many animals, including humans), and (bottom) the “straightened airway” (same length as bony-bounded and soft-tissue airways but without convolutions). The basic airway is the least efficient, and the long convoluted soft-tissue air is the most efficient as well as the most realistic. The long straight airway was also very efficient but less so than the convoluted airway, indicating that the twists and turns contribute significantly, probably due to the increased vorticity that slowed down the airstream and increased the chance for heat transfer. Courtesy of WitmerLab at Ohio University. The skull of the Late Cretaceous armored dinosaur Euoplocephalus that was used in the study. This movie is associated with an article published in PLOS ONE on 19 December 2018 (http://bit.ly/2rzFudE) by Jason Bourke, Ruger Porter, and Lawrence Witmer. Nasal airflow was modeled using Computational Fluid Dynamics analyses for two Late Cretaceous ankylosaurian dinosaurs, Panoplosaurus and Euoplocephalus. The video demonstrates how the highly convoluted nasal cavity in both species warms the inhaled air on its way to the lung and then cools the exhaled air, resulting in a highly efficient system of air conditioning that conserves both heat and water. For more in this project, visit the WitmerLab project page: http://bit.ly/2EwOzMO. 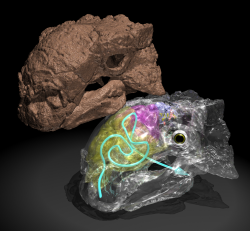 Animated GIF (640x360, 10 MB): Heat exchange of inspired air as it passes through the tortuous nasal cavity of the Late Cretaceous ankylosaur Euoplocephalus. The computational fluid dynamics analysis shows the flow of air during inhalation, with color—i.e., gray to red to orange to yellow—indicating progressively warmer temperatures. 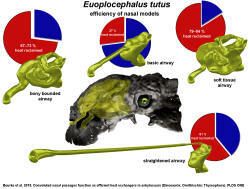 Euoplocephalus has a very efficient nasal cavity, fully warming and humidifying the inspired air before it reaches the lungs. 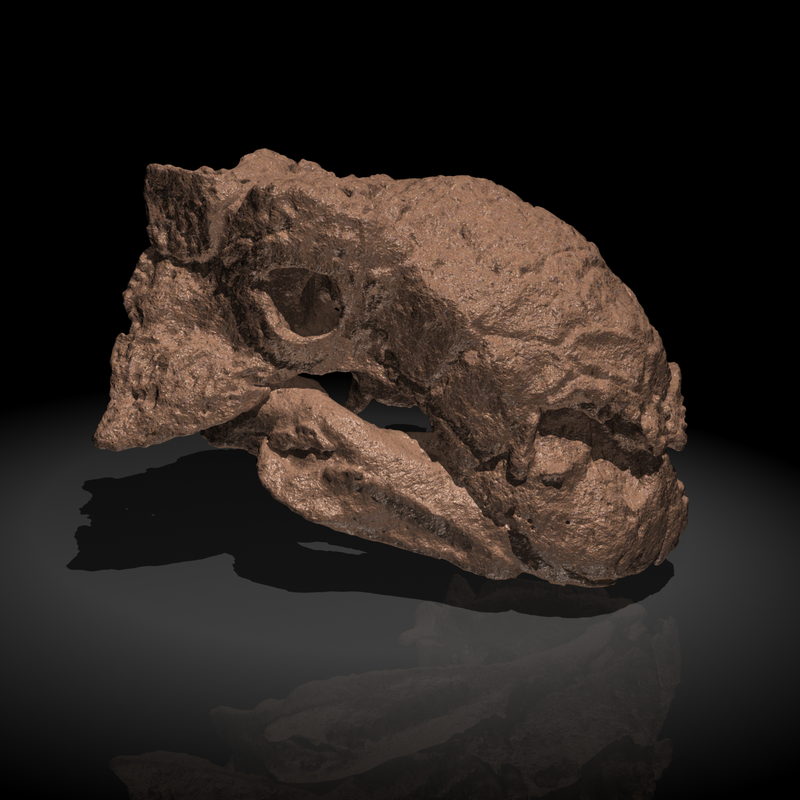 Panoplosaurus, with its simpler nose is somewhat less efficient but still impressive. Likewise, on exhalation, the long convoluted airways cool the expired air, saving heat and energy. Courtesy of WitmerLab at Ohio University. • To view, copy, and/or save a 1280x720 (36 MB) version of this GIF, click here. Authors of the article investigate key features in the skulls of ankylosaurian dinosaurs in WitmerLab at Ohio University. From left: Jason Bourke, Ruger Porter, and Lawrence Witmer. Courtesy of WitmerLab at Ohio University. 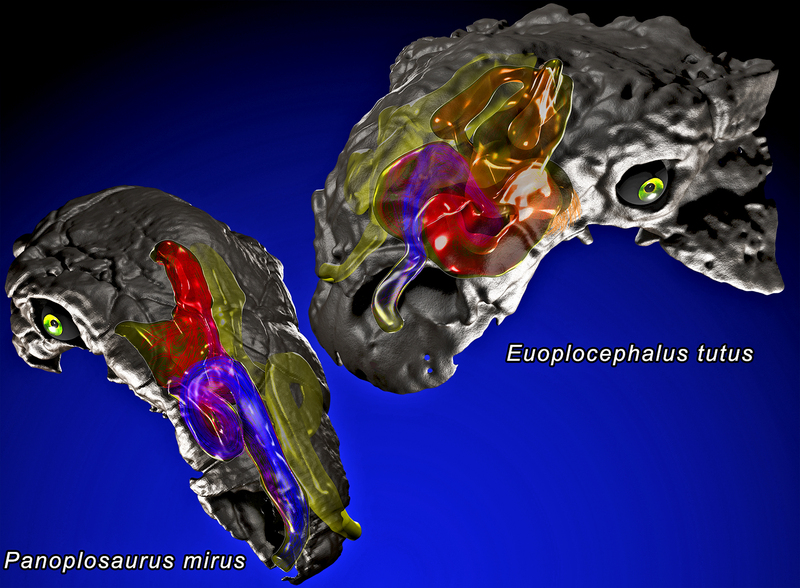 3D-PDF of the skull and nasal passages of the ankylosaurian dinosaurs Euoplocephalus and Panoplosaurus, showing the four different shapes of the airways tested: “bony bounded” airway (as preserved in the fossil), “soft tissue” airway (closer to real life due to restored nasal mucous membrane), “basic airway” (short and simple, as in many animals, including humans), and “straightened airway” (same length as bony-bounded and soft-tissue airways but without convolutions). 3D-PDF files should be saved and then run on your computer; they will not run in a browser window. Courtesy of WitmerLab at Ohio University. 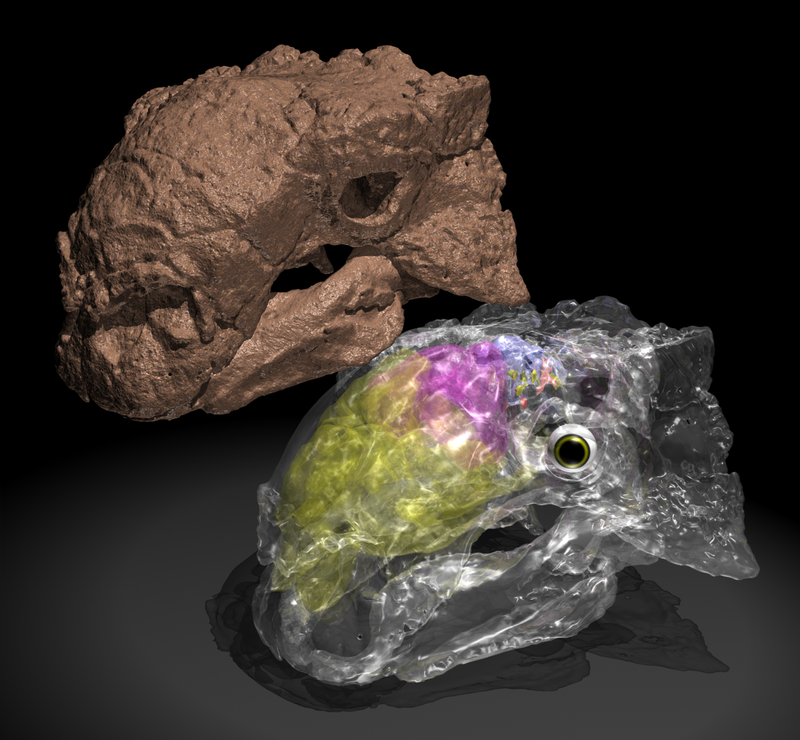 Skulls of the Late Cretaceous armored dinosaur Euoplocephalus represented as a solid skull (left) and as a transparent skull, revealing the long convoluted nasal cavity within the snout. ATHENS, Ohio (Dec. 19, 2018) – Being a gigantic dinosaur presented some challenges, such as overheating in the Cretaceous sun and frying your brain. 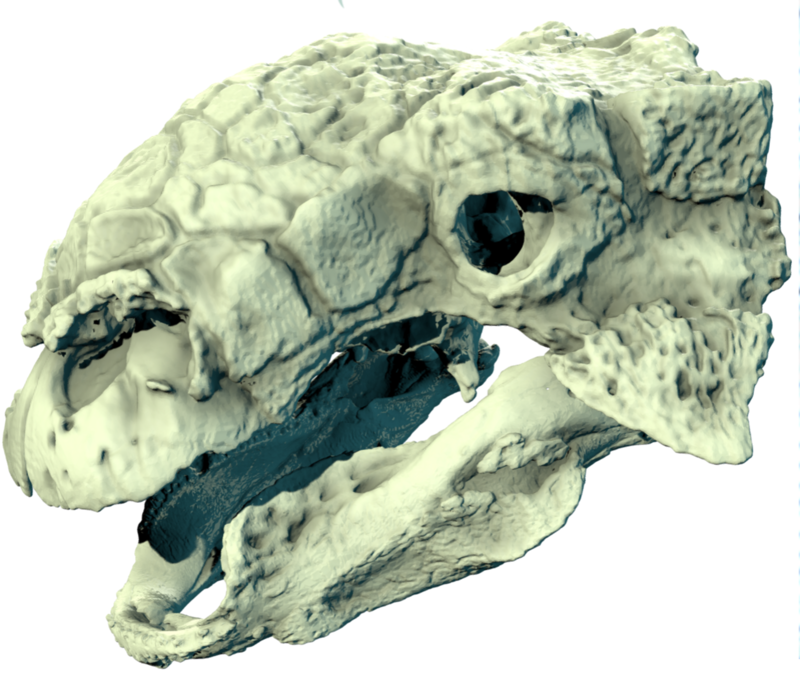 Researchers from Ohio University and NYITCOM at Arkansas State show in a new article in PLOS ONE that the heavily armored, club-tailed ankylosaurs had a built-in air conditioner in their snouts. Visit OHIO's official media page for the latest University news and updates, or follow us on Twitter @ohioumedia. This website provides supplementary information as an adjunct to the published paper. Witmer, with the skilled assistance of Ryan Ridgely, is responsible for the content of the website. Content provided here is for educational and research purposes only, and may not be used for any commercial purpose without the permission of L. M. Witmer and other relevant parties. This project was funded by grants from the National Science Foundation.